After you start the Play Music app o your Android, you see a screen similar to the one shown here. To view your music library, choose My Library from the navigation drawer. Your music library appears on the main Play Music screen. 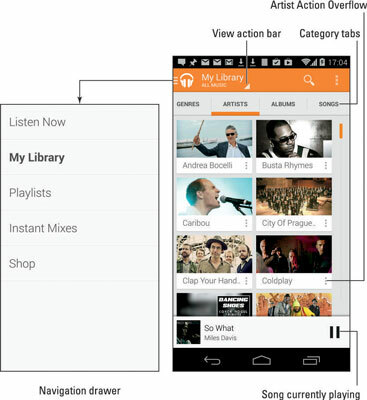 Touch a tab to view your music by categories such as Artists, Albums, or Songs. You can choose the Listen Now category from the navigation drawer to see songs you frequently listen to or tunes the phone guesses you will like. The more you use the Play Music app, the more you’ll appreciate the results displayed. Music is stored on your phone’s internal storage as well as on the microSD card. Use the View action bar to choose which music to view: The All Music item shows all music available on the phone as well as with your Play Music account on the Internet. The On Device item directs the Play Music app to show only the music stored directly on the phone. The size of the phone’s storage limits the total amount of music you can keep on your phone. Also consider that pictures and videos stored on your phone horn in on some of the space that could be used for music. Album artwork generally appears on imported music as well as on music you purchase online. If an album has no artwork, it cannot be manually added or updated (at least, not by using the Play Music app).